Salam. I wanted to share some information regarding this student of Haji Imdadullah Muhajir Makki who it is said was a faithful representative of his teachers ‘maslaki preferences’. As you will read he founded the Jamia al-Nizamia in Hyderabad which is an educational institution which is still functioning today and serving the Muslims of the Deccan, and is known in scholarly circles for its balanced and ‘neutral’ approach. Insha-Allah I hope to be able to post more information on the other Khulafah of Haji Imdadullah from the ‘Nuzhat al-Khawatir’ in the future. He is the Shaykh and most learned scholar: Anwarullah bin Shujah al-Din bin al-Qadi Siraj al-Din al-Umari al-Hanafi, al-Qandahari al-Hyderabadi, one of the well known scholars. He was born in the village of Qandahar in the district of Nander in Deccan with four days passing from Rabi al-Awwal 1264. He memorized the Quran and studied the shorter works (mukhtasarat) with the teachers of his land. 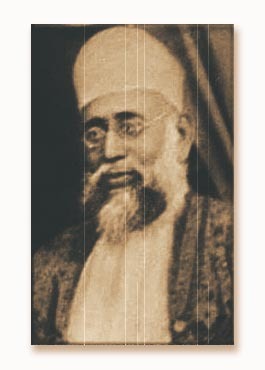 He studied with Shaykh Abd al-Halim al-Ansari al-Luknawi, then kept the company of his son Shaykh Abd al-Hayy al-Luknawi in the city of Hyderabad. He took tafsir from Shaykh Abdullah al-Yamani and Tasawwuf and spiritual wayfaring (suluk) from his father from whom he received an ijazah. He was decribed as having gained expertise in a number of the Islamic sciences. He performed the pilgrimage in the year 1264 where he met the great Shaykh Haji Imdadullah Muhajir Makki to whom he pledged allegiance and from whom he also received ijazah. He was selected as a teacher by the ruler of the Deccan: Mahbub Ali Khan the sixth Nizam. In the year 1301 he travelled for his second pilgrimage and in the 1305 for a third, taking up residence in Madinah the Illuminated for three years. He returned to Hyderabad in the year 1308 and was appointed a teacher by the crown prince Uthman Ali Khan, and when the ruler of the Deccan Mahbub Ali Khan passed away in the year 1329 Uthman Ali Khan became the seventh Nizam in the year 1330. He proceeded to appoint Mawlana Anwarullah the minister of Awqaf in the year 1332 and gave him the title ‘Nawab Fadilat Jung’. In Rabi al-Awwal of the year 1332 he was appointed tutor of the crown prince and his brother by which he was able to achieve great influence in religious matters by which he undertook many reforms and benefitted the land and its people. “He was unique in his age in the rational and transmitted sciences (ulum al-aqliyyah wal-naqliyyah). Heavily engrossed in worship, continuous in being busied with teaching, consultation, reading of books and writing. Severe in condemnation of the people of innovation and desires. He established the Madrassa al-Nizamiyyah in Hyderabad in the year 1293. He founded an academy for writing and publishing calling it ‘Ishaat al-Ulum”. He was tall, broad shouldered and of a medium build. Fair skinned mixed with redness. Wide eyed and with a full beard. He did not pay excessive attention to food and clothing and took care to perform physical exercise till the end of his life. He exercised precaution in wealth, positions and posts. He was forebearing and humble, he would visit the sick and attend funerals. He was a person of goodness and righteousness, not accumulating wealth nor caring for it. He was gentle in his speech and far removed from harsh language and boycotting others. He would teach the Futuhat al-Makkiyyah after Maghrib till the middle of the night, and had an immense repect for Shaykh Muhyiuddin Ibn Arabi. Towards the end of his life he would spend his nights with matters relating to knowledge and would sleep after Fajr until the break of day. He was also known for his love for collecting rare books. Maqasid al-Islam in 11 volumes, all of them in Urdu. He passed away after Jumadi al-Akhir in the year 1336 and was buried in the Madrassa al-Nizamia which he founded.